Stories are a very important aspect of our society, and storytelling is one of the things that make us uniquely human. Stories convey important knowledge about the world around us, often in a simplified yet dramatic fashion designed for maximum impact. We have much to learn, remember, and understand in life, but wrap a great story around something and it will make an impression on us that lasts a lifetime. So where do maps fit in the storytelling realm? 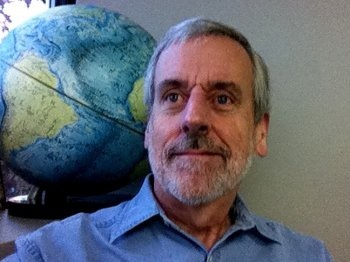 I recently spoke with Allen Carroll, who left National Geographic about a year ago and is now ArcGIS Online Content Program Manager at Esri, about Story Maps—a new initiative he’s working on with David Asbury, Lee Bock, and Stephen Sylvia to integrate storytelling and maps. You were Executive Vice President and Chief Cartographer at National Geographic Maps for a number of years. What led you to Esri? Allen: During my time in Nat Geo Maps I became familiar with Esri and was fortunate to become good friends with Jack Dangermond, who was extremely supportive of our efforts. I attended a number of Esri User Conferences, and had the opportunity to work with many people in Redlands and at the DC office. We worked with Esri to enhance National Geographic’s cartographic database, and National Geographic and Esri collaborated to produce the National Geographic MapMachine, which was one of the first interactive atlases on the Internet. I admired the company very much, and was especially excited about its support of non-profits and the fact that ArcGIS enabled creation of vast amounts of exciting and important data. So much of that data begged to be interpreted and distributed to broader audiences. And it still does! So as someone who had been telling stories with maps for many years, the move to Esri was exciting, easy, and a natural extension of my work at Nat Geo. While you were at National Geographic you were working the Global Action Atlas (which evolved into National Geographic Explorers | Take Action). 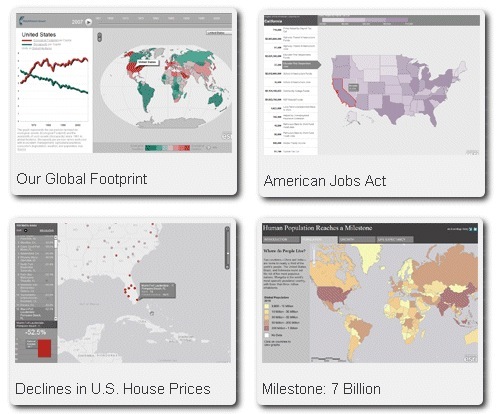 One of your current projects at Esri is Story Maps. Is there a common thread between these initiatives? Allen: Absolutely there is. I believe in the power of maps and geography to educate, inform, and inspire people to action. The Global Action Atlas was a wonderful opportunity to demonstrate how to use maps to enable people to discover important work being done around the world on behalf of people, cultures, and the natural environment. Story Maps provides a wonderful platform to continue to demonstrate that power. By the way, it’s exciting to see that National Geographic has expanded on the Atlas with their recent launch of the Take Action initiative. I hope that many of our map stories will inform and inspire as well. What’s the big idea behind the Story Maps initiative? Allen: I guess I just articulated one idea: To use maps in new and innovative ways to get people excited and involved in the world. Another big idea is that ArcGIS has been widely embraced as a tool for management, analysis, decision support, modeling, and situational awareness. ArcGIS has huge promise in another arena: communication. Thanks to continuing changes in the Internet, cloud computing, mobile and tablet platforms, and to constant improvements in the software itself, we can now put the power of GIS into the hands of managers, CEOs, reporters, school kids—everyone. The goal of the Story Maps effort is to prove that point, and to enable thousands of GIS users to tell their own stories. The Story Maps Gallery lets you select a map story, read a summary of how it was made, and comment or ask questions. What’s the attraction of telling a story with a map? Allen: Efficiency is one. Maps are wonderful organizers of information. And they’re an ideal stage on which to spin a narrative. I’ve always loved the way maps tickle both sides of the brain: They invite inspection, analysis, critical thinking—but they can (and should!) also be things of beauty, appealing to our more intuitive, aesthetic impulses as well. So they’re an ideal way to engage people. What has the reaction been so far to Story Maps? Allen: Very good, which is gratifying. But I have to confess that the jury is still out. We’re really just getting off the ground. The proof will come in our ability—knock on wood—to attract a larger audience, and to enable and inspire others to tell stories with maps. So ask me again in a year or so. What can we look for in the future from the Story Maps initiative? Allen: We’re striving to be more relevant and newsworthy. So look for more Story Maps in 2012 that relate to current issues, including the economy, unemployment, the elections, sustainability, poverty, and so on. Not that we won’t have fun every now and then, too. I really do feel we’ve just barely scratched the surface. I hope we can find new and unexpected ways to interact with maps. Tablets provide some especially promising opportunities, of course. How can people participate in Story Maps? Allen: We’d love people’s ideas about new topics, new or hidden data sources, interesting GIS work that begs to be shared with a wider audience. We need people to criticize us too. We also, by the way, want to do more to involve our audiences: to enable users to share their own location information, photos, and opinions. Now that so many of us walk around with location-enabled devices, we should be engaging people in new ways, and recruiting them as authors and contributors to Story Maps. 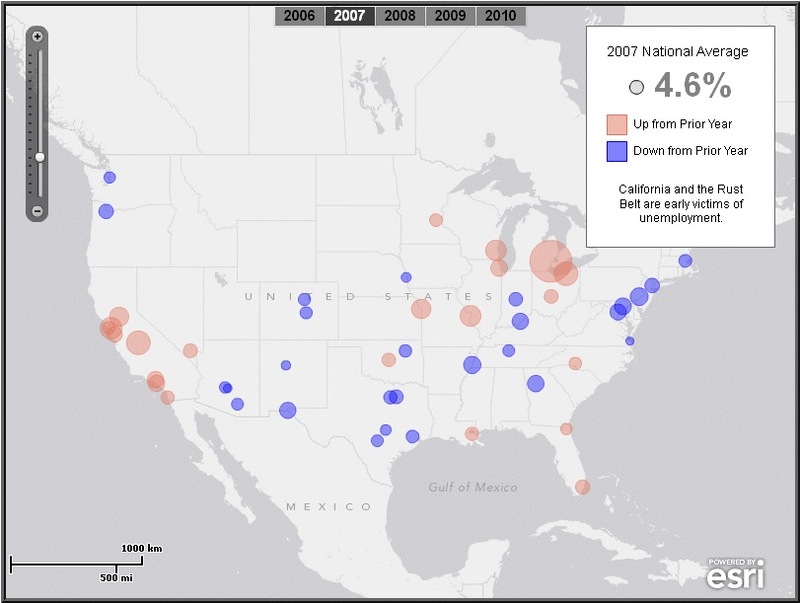 “Tale of 50 Cities: Unemployment” tells the story of U.S. unemployment geographically. What other initiatives are you working on at Esri? Allen: I continue to help with strategy and content for ArcGIS Online, although limited a bit by both time and distance. We’re working hard to develop maps, apps, and templates that make the benefits and capabilities of GIS available and usable to more people. The rapid evolution of ArcGIS Online, now available for organizations to customize for their own uses, has been exciting to watch, and gratifying to be involved in. The expansion of GIS outward from the realm of the techno-specialists has huge implications that we’re still struggling to fully grasp. One of the pleasures of working at Esri is that the opportunities and challenges are so big, and varied, and constantly changing.